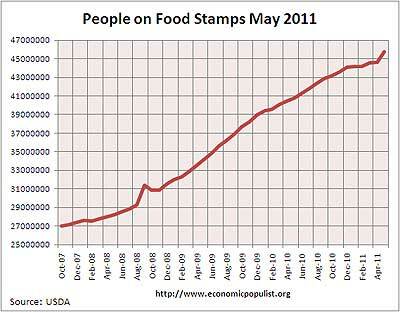 The number of people on food stamps in the United States exploded in May 2011. There were 312,240,000 people in the United States, mid May. 45,753,078 of them were on food stamps. That's 14.7% of all Americans on food stamps. The average monthly amount? $133.80. This is the new economic metric, how many people are so poor, so broke, they qualify and use food stamps. The data is hard to find, not explained and located on the USDA site. That's 2.5% increase from just last month and a 12.1% increase from May of last year! Even more telling the amount of people on food stamps has increased 69.4% since October 2007. Since the so-called end of the Great Recession, people on food stamps has increased 28.5%. Alabama food stamp usage increased 102.9% in one month or by 893,668 people. That's right, after tornadoes swept through the region and the press leaves the area, devastation rolls on. Without Alabama the food stamp monthly increase would have been 0.5% from last month. Regardless of the emergency assistance for Alabama pushing up the numbers, the statistics are still bleak and damning across the board. 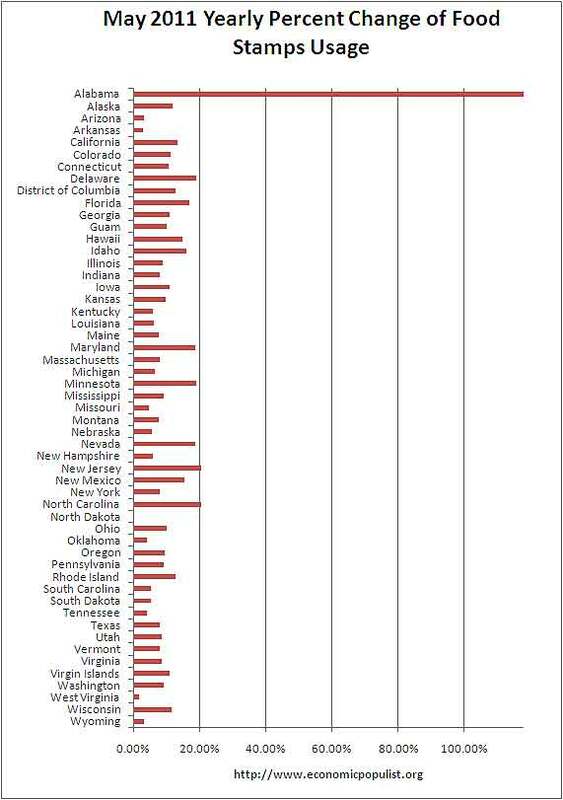 Below is the yearly percentage increase in food stamps for each State. 22 States had > 10% increases in food stamps usage and only North Dakota showed a decline of -0.1%. Every other State's food stamp participation increased from a year ago. Nutrition assistance now accounts for more than half -- or about 67 percent -- of the USDA’s budget, compared with 26 percent in 1980. That shift in focus, critics say, is ineffective because it hasn’t put a dent in poverty or hunger in the United States while taking away money from other programs, specifically agricultural programs that should be the main focus of the agency. The Republicans’ 2012 budget plan proposes changing SNAP from an entitlement to a block-grant program that would be tailored for each individual state, much like their proposal for Medicaid. States would no longer receive open-ended subsidies and the aid would be contingent on work or job training. It would also limit funding for the program. Oh, food stamps never solved poverty, therefore people should starve. Love the logic! Doesn't the increase also have to do with more liberal regulations since January 2009? I have no personal experience here, but I think I read something about this in a 'senior' newsletter. One of the changes, I believe, allows people who are spending down their savings (due to unemployment, etc.) to receive food stamps before they are actually destitute. It's possible that the recent budget "compromise" is going to return the Department of Agriculture to the former rules. Who knows what the juicy details are of that monstrosity? There are also Food Stamp issues related to immigration, but I have no idea how that works -- probably very differently from state to state or even county to county. It's like everything else -- there are people who really need and deserve ... and then there are scammers. You may see in grocery stores people using something like credit cards rather than paper currency-like 'food stamps'. (It's one of the options on the screen you see when you swipe your regular credit or debit card.) That's good because there was once (some years ago) a bust by the D. of A. of a printing plant in Chicago that was printing up counterfeit 'food stamps' to be fed into various stores. Now that's scamming! You pretty much have to be dead, in a box, with no income. I'm not sure about regulations but the poverty levels haven't been adjusted, beyond COLA (probably) and they are so low, I don't know how anyone stays alive and still qualifies. If you can research out and find a citation, source, I'll take a look. If the levels and requirements changed, it would be on site government site. Also food stamps are issued and determined by the States, so each state probably has it's own specifics, although the poverty rate is standard across states (the poverty rate is a federally determined ratio, then cost of livings adjustments, I believe, are made per state). "Beginning July 1, 2009 ... "
"If you can research out and find a citation, source, I'll take a look." Beginning July 1, 2009, income limit for most households is 185% of the Federal Poverty Level (FPL), with no net income or asset limit. Households with an elderly (ages 60+) or disabled member do not have to meet a gross income limit. Instead, shelter, medical, and other qualifying expenses are deducted from gross income. If the gross income of an elderly/disabled household is below 185% FPL, there is no asset test and there is no net income test. Although legislation enacted in the First Hundred Days of the 111th (Democrat) Congress was far from ideal, if I could at this point turn the clock back and extend the 100 days to over 1,000 days, I'd do it in a New York minute! I know that you would object to whatever they were cooking up in the way of immigration "reform" (some version of the Dream Act) as insustainable and riddled with loop holes, but it'd still be better than the mess we have today! Just giving the devils their due. BTW: Thanks for catching me up on the latest acronym! Yes, it's no longer 'food stamps' -- it's 'SNAP'. "Isn't that special?" I'm pretty sure one cannot have income about $14k annual and if you realize it, that amount isn't enough to rent a cardboard box in most areas of the country. I don't think it's a law change that has 15% of the population on food stamps. I think it's pure economic, job losses and when one gets a job, it's probably part time, no benefits and that would put someone below the poverty rate, very easily. The median income in the U.S., where half of working people reporting income is, ...$26k. That's astounding, all of America is dirt poor and frankly if someone is making $26k a year, they probably also need some food stamps in most areas of the country. How about we agree on correlation? Good grief! I never said that high number of food stamp households was caused primarily by other than unemployment and low family income. I merely pointed out a statistical contaminate. What's the big deal? Are we interested in contributing or hidden variables, or not? What kind of statistical inference or analysis is this? What's this thing about "pure economic, job losses" anyway? Great Scot, man, we're talking about statistical 'reality' -- no "purity" to it! Did you really think that I was arguing that EP's estimates of national unemployment or poverty are exaggerated? Are you seriously impugning my source webpage (titled "Food Stamps") because it cites State of Connecticut regulations? Have we not stipulated that this SNAP thing varies from state to state, is implemented by the states? Instead of useless attempt to impugn my sources, why don't we go for this: the underlying causes of increase in food stamp households correlates (a) with the Democrats' congress and administration resulting from November 2008, (b) with the recession of 2008-20? ?, and, (c) with liberalization of the politico-administrative environment responding to human needs associated with the recession? How's that? Forget causation. That's hard to show and maybe meaningless in the context. We're talking correlation. BTW: I don't have stats for this, but I know for sure that acceptable houses and apartments (even without rent control or HUD subsidy) go for $500/month (including new renters in 2011) in many parts of the country, although probably not in habitable parts of big cities.